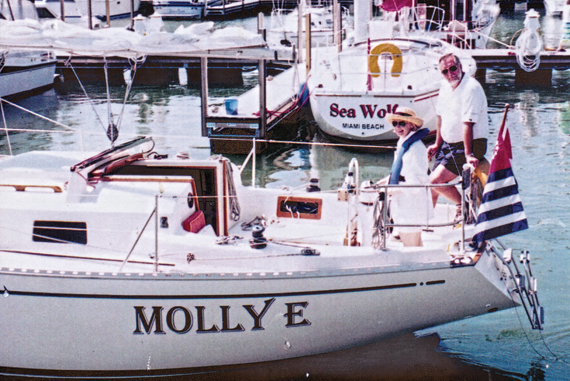 I have enjoyed boating since my preteen years as a “frequent” family activity. I am proud to have carried the love of the water on to our three grown children and soon-to-be six grandchildren. Karen and I have owned small sailboats (22, 27, and 32-foot) for the majority of our 48 years of marriage. Cruising areas have varied from local lakes and rivers, in my early years, to charters in the Florida Keys, Bahamas, Virgin Islands, The Dry Tortugas, Cuba, and ten fantastic days on a 45-foot Magic in the Greek Isles. Karen and I have enjoyed annual trips to the Lake Huron / Port Huron area. I have also participated in the delivery of several boats from Port Clinton to Philadelphia, and Long Island. I have enjoyed teaching and studying in Maritime classes sponsored by both the United States Power Squadron and U.S. Coast Guard Auxiliary. I hold a Senior Navigator certificate in the Power Squadron, and have held the honor of teaching the Power Squadron Seamanship class for the Columbus Sail and Power Squadron for over 13 years. Karen and I both enjoy the social and fraternal associations in organizations such as the GLCC (2005), the United States Power Squadron and Columbus Sail & Power Squadron, Sandusky Sail Club (1997), and Sandusky Yacht Club (2015) Crews Nest (12+ years). I have had the opportunity to serve as both Squadron Commander (1993-94) and District Commander of District 29 (2015-16), and became a life member (2011) in the Power Squadron. We always enjoy spending time with fellow boaters. If you see the Molly-E, please give us a hail.